In the wake of the Industrial Revolution during the last decade of the 19th century, railroads had become the arteries and vessels of the United States of America. Hundreds of thousands depended on rail traffic not just to transport themselves but their goods as well. Even the postal system relied on trains for its sustenance. Taking advantage of that robust need was the Pullman company, founded by George M. Pullman. Pullman manufactured rail cars, most famously luxury sleeper cars that came to be a standard for rail travel. According to David Ray Papke in his book The Pullman Case, the business grew to a point where in 1879 it grossed $2.2 million, which equates to just south of $8 million in today’s money. As Pullman’s company grew so did his ambitions. Just outside of Chicago on an available tract of land he incorporated a township which also bore his last name in 1881. Within those borders he erected what he envisioned would be the future of manufacturing. Adjacent to a new production facility he built living quarters for workers, along with seemingly everything else they would need for their off-hours. A church, hotel, library, school and shopping mall were all available to residents, and all owned by Pullman. There was more trouble coming down the figurative tracks than Ely’s scathing op-ed, however. In 1894 35 percent of Pullman’s factory workers joined the American Railway Union and made demands of the Pullman Company. It was their assertion that cuts in their wages, layoffs and rising rents and utility fees were unfair given the facts that foremen enjoyed raises and the Pullman Company was paying out sizeable dividends to shareholders on a quarterly basis. After two meetings, one with Pullman himself and several of the leaders of the workers’ group losing their jobs in retaliation, the union voted overwhelmingly to strike. The solidarity of the American Railway Union behind the Pullman factory workers was what really made the Pullman Strike a matter of national importance. Switchmen (railroad employees responsible for actual rail traffic) joined in a national boycott of Pullman cars, refusing to move them. In some areas, rail traffic came to a complete stop. Goods were spoiled. Mail was delayed. People were stranded. Despite the broad and serious effects of the boycott and strike, Pullman was not forced to the bargaining table. The courts and other parts of the federal government saw to it that would be unnecessary for Pullman. What resulted instead is one of the most corrupt strings of legal proceedings in the history of the United States. Judges who had tangible ties to the railroad industry worked in tandem with prosecutors who also had personal ties to Pullman himself to issue injunctions that effectively nullified the strike and imprisoned union leaders without cause. Going all the way to the US Supreme Court in 1895, the proceedings were an unashamed display of how strongly in the pocket of the railroad industry the federal government was. Move forward in time and to a different industry in the present day. Like how so much of the United States was dependent on the railroad industry in the 1890s, the sport entertainment industry in the United States is reliant upon NCAA American football and men’s basketball. That has created an environment for athletes that is similar to that which the Pullman workers lived in. Almost in homage to Pullman’s ideology, NCAA-member institutions across the country have constructed all-inclusive facilities for their revenue-sport athletes which include living, recreational and working spaces. The aim of these facilities is to immerse the athletes in the program. That’s a direct throwback to Pullman’s philosophy. Papke details in his book how Pullman saw the town that shared his name as a place where the civic traits and moral values he desired to have his workers display would be cultivated. Among them were an abstention from alcohol and a Puritanical work ethic that he far from espoused personally, The NCAA and its member institutions love to tout how in exchange for their revenue-generating labor athletes are receiving a free education and learning how to conduct themselves in society as responsible citizens. Like for Pullman, it shouldn’t be glossed over how workers conducting themselves by those standards is a good thing for the bottom line and reputation of the NCAA and its member schools. Another important philosophical similarity between Pullman himself and the NCAA is the view of the freedoms of workers along with the relationship between capital and labor. Pullman, as the source of the capital, saw himself as being in position of wanting to buy labor from workers and able to dictate the terms upon which he wanted to purchase that labor. Workers, in his view according to Papke, were free to choose whether or not to accept those terms. While that sounds egalitarian, the equity quickly dissipates after that initial transaction. Pullman saw himself as uniquely qualified in the capital-labor relationship to modify those terms without the approval or even notice of the workers at any time. While he also acknowledged the freedom of the workers to sever the ties at any time, he was in the position of power as the one holding the purse strings. For example, Pullman workers were not required to live in Pullman, Ill., but those who did not do so were often the first to be laid off. The NCAA and its member institutions are in the same position of power. The NCAA and its member schools are free to change the rules for eligibility and continued employment of workers (athletes) at any time without the approval or even notice of those workers at any time. Continuing with the example in the last paragraph, athletes who choose not to inhabit athletic department facilities at all times could be the first to suffer roster cuts, with coaches citing questions about their commitment to the program. The athletes are technically free to transfer to other programs but there are significant costs to doing so which include sacrificing a year of eligibility. That exact policy of restricting worker movement was recently challenged in Deppe v. NCAA. In the case, the federal 7th District Court of Appeals ruled that the NCAA’s by-law requiring athletes to forfeit a year of eligibility in order to transfer from one school to another promoted competition between individual member schools of the NCAA and therefore was not illegal. This shadow of the legal proceedings in regard to the Pullman strike creates opportunity to consider some hypothetical situations. If NCAA revenue-sport athletes ever embarked upon a work stoppage en masse like Pullman workers and the American Railway Union switchmen who boycotted, it could have a similar but perhaps smaller effect on the US economy. Hundreds of vendors of goods from athletic gear to food service to transportation would see their businesses suffer. Hotels would see cancellations, ticket vendors would field calls demanding refunds and broadcasters would be scrambling to fill time slots. It would be chaos that perhaps hasn’t been seen since the 1890s. The 7th’s ruling in Deppe and the conduct of the courts in the Pullman case might be a foreshadowing of how present-day courts would conduct themselves in response to such a serious sequence of events. Judges who might be boosters of athletic departments might work in concert with prosecutors who have personal ties to their alma mater’s programs to craft injunctions forcing the athletes back on the court/field. In Deppe, it was apparent the court was only considering the antitrust applications of the NCAA’s bylaws as far as they affected the disparate institutions in the NCAA, demonstrating no concern as to how those bylaws affected the athletes and disregarding that instead of true competing firms, NCAA member institutions are instead players in a cartel which exists to restrict worker rights. It’s possible that bias in favor of capital against labor could be pervasive. All of that is hypothetical at this point but given how many similarities that already exist in these situations, it’s not out of the realm of possibility if not likelihood. 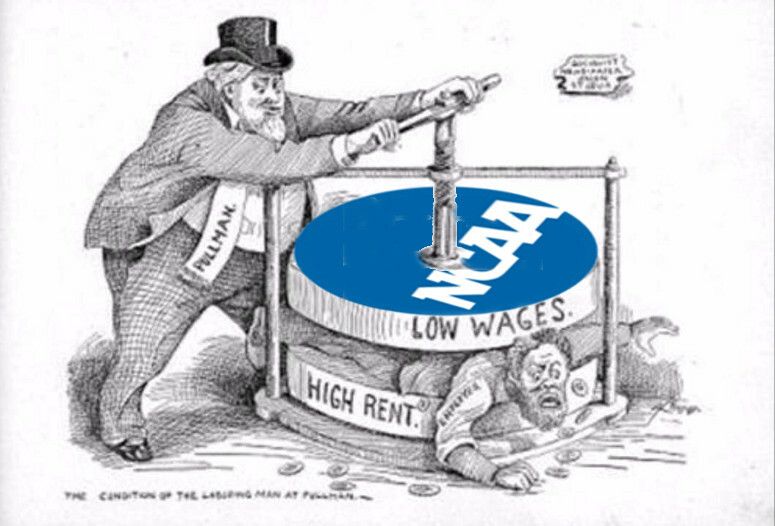 The lesson that should be taken from this review of history is that advocacy for the rights of these workers has never been a more serious issue, as if the sequence of events from Pullman in the 1890s plays out again, NCAA revenue athletes will face a serious disadvantage in the courts and against the power of capital in the future.